Halloween 2017 Siege Map, featuring Old siege with Gates (or Towers) + Final Castle objective. You are receiving less damage. Lazarus but seems likely to be called Terminus as the new Cards are from Terminus instead of Lazarus . Apparently it features a Fake Death. I’m not sure if you can actually suicide yourself and then resurrect, but indeed when you die, after 3 seconds, you resurrect yourself. [Charge Blast] Charge blasts deal an additional 100 damage each. [Armor] Below 50% HP gain 35% Damage Reduction. [Armor] You cannot be slowed below 60/70/80/90% of your base movement speed. [Armor] Below 50% Health receive 5/10/15/20% more Healing. [Absorption Field] Reduce the damage required to generate a charge by 100/200/300/400. [Absorption Field] Reduce the self slow of Absorption field by 15/60/45/60%. [Charge Blast] Enemies affected by Charge blast are revealed for 1/2/3/4s. [Shatterfall] Heal for 100/200/300/400 for every enemy you hit with Shatterfall. [Shatterfall] Gain 8/16/24/32% damage reduction for 2s after landing from Shatterfall. [Shatterfall] Increase the leap distance of Shatterfall by 10/20/30/40%. 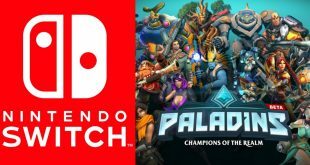 Is Paladins coming to Switch?